I am a terrible baker. Truly awful. So with Bake Off starting tonight, I thought I’d share my one successful bake. 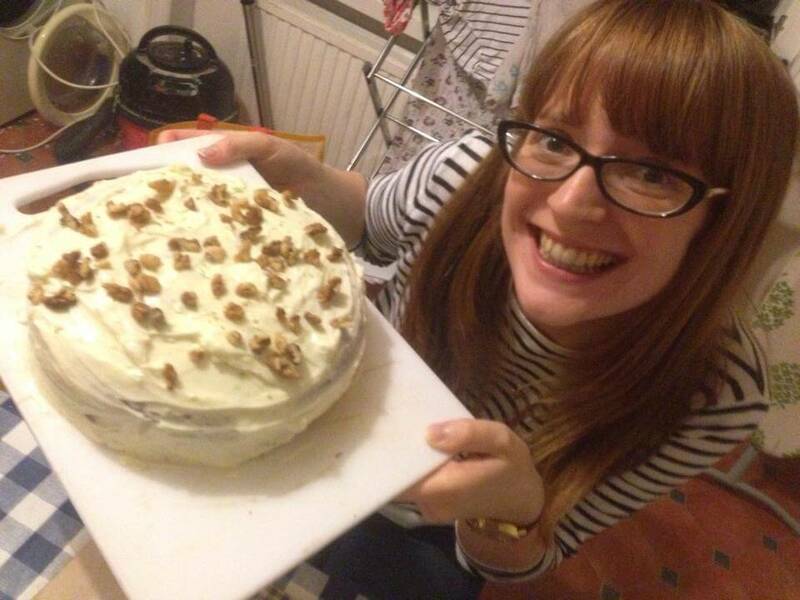 It’s a Jamie Oliver recipe (with a few minor tweaks) for carrot cake with a lime mascarpone icing. I cooked this earlier this year in a gas oven older than me, and although I had to constantly rotate the cake to stop it burning and massively extend the cooking time, it was a monumental success. The icing is delicious too – fresh, light and makes a lovely change from the more traditional butter icing. PS. Please ignore the general mess in the photo on the left. I am very proud of this cake, but this is the only photo I have. Preheat the oven to 180C/350F/Gas 4. Or, if your oven is anything like mine, just whack it on medium-ish and hope. Grease and line an 8” round cake tin. Jamie recommends a 22cm square tin, but I found the round one worked just as well. Which is a relief as it’s the only one I have. Beat the butter and sugar together until it goes pale and fluffy. Beat in the egg yolks one by one. I did this by hand, but a mixer is fine too. Add the orange zest and juice and mix. Stir in the sifted flour and baking powder, and add in the ground almonds, walnuts, spices and grated carrot and stir well. In a separate bowl, whisk the egg whites with a pinch of salt until stiff. Takes ages. Gently fold them into the cake mix. Make sure there’s no lumps of egg white left in the mix. Dollop the mixture into the cake tin and cook for 50 minutes until golden and risen. Mine took way longer than this – about 1hr 10mins – so use your judgement. The cake is done when you poke a cocktail stick into it and it comes out clean. Leave the cake to cool for a few minutes, before turning it out onto a rack (a grill tray or tennis racket will also do the job… I’m not joking) and leaving to cool. Once the cake has cooled, mix together all of the ingredients for the icing. I found the juice of 1.5 limes to be about right for me, instead of the full two. Spread the icing generously over the cake, and finish off with a sprinkling of chopped walnuts. One thing I would say, if you don’t planning on scoffing the lot in one sitting, it might be worth not covering the whole thing with the icing just yet. The icing went a bit gloopy when left out, which meant I had to put the whole cake in the fridge. It’s quite a deep cake, so you could slice it in half and ice one layer for immediate munching, and save the other.